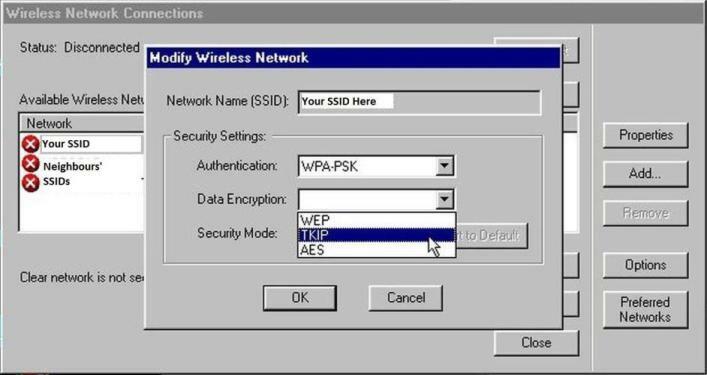 I have recently achieved something I previously thought to be impossible: connecting a Windows 98 notebook PC to a modern network secured with WPA-PSK. Here, I’ll discuss the specifics of this configuration and the high-level steps to take to achieve the same. Right off the bat, we need to establish some things. This is a fairly specific configuration; you could mix-and-match various details and possibly end up with a working result. However, I can only speak to what I’ve tried, so I’m not straying from that here. 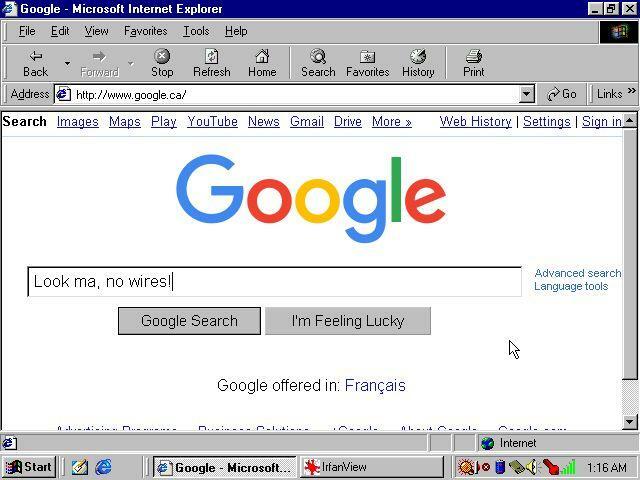 To get a notebook PC equipped only with 16-bit PCMCIA slots, running Windows 98SE, onto the same wireless network I use with my modern Windows 10 notebook and Android smartphone. This is the point of this post: there is a big burning hole in the link between Win98 and WPA when the sole means of connecting the card to the PC is 16-bit PCMCIA. If your notebook has, and the card you intend to use is Cardbus or USB, then this post will have you jumping through hoops you really don’t need to bother with. 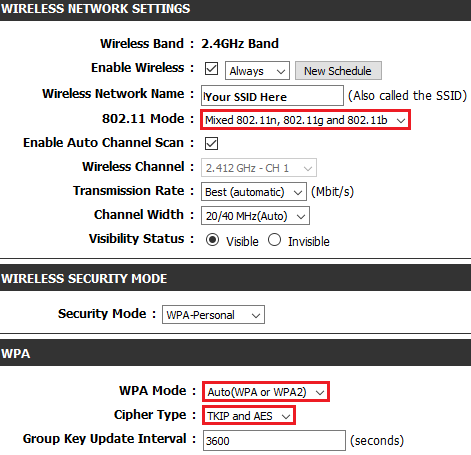 To eliminate special accommodations for old wireless clients: no more second SSID broadcasting with lesser or no security, no second router with no security, etc. It would also gain the convenience of using the PSK (pre-shared key; wireless password) instead of hopelessly irritating WEP keys, without leaving the network open for all the neighbours to hop onto as they please. Note: security was not a particularly high priority here. 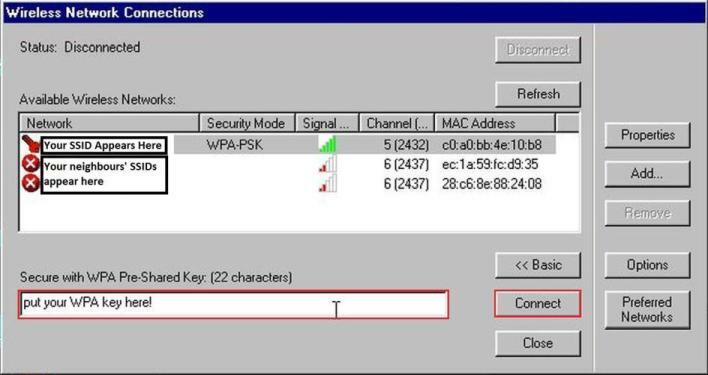 WEP can be cracked rather easily, but so can WPA. I was strictly looking to streamline things and get rid of the other annoyances of WEP or open networks. The first challenge I encountered was finding a NIC suitable for my purposes. The local e-waste recycler holds “garage sale” events so I went and checked them out…many times, over the course of months. I ended up with quite the pile of PC Card NICs, in both 16- and 32-bit form. The pattern I found, which seems to be true on the overall, is that there was no 16-bit PCMCIA wireless card supporting higher than Wireless-B (802.11B). All Wireless-G PC Cards are Cardbus (32-bit). One can use a 16-bit card in a 32-bit slot, but not the reverse, so that already cut my pile of cards in half. Wireless authentication/encryption is not directly linked to the specific protocol/type of network supported by the card (B, G, N…), but they tend to correlate due to the age of the card. In some cases, encryption techniques were later added to earlier cards, so there is such a thing as a wireless-B card which originally supported only WEP, which has had WPA support added to it via a firmware update. However, this is not true of all cards (I think it’s the minority, actually). What all of the above means is, if you are limited to 16-bit PCMCIA, you need to find a card which is 1) wireless-B, 2) 16-bit PCMCIA, and 3) has WPA support in hardware/firmware. 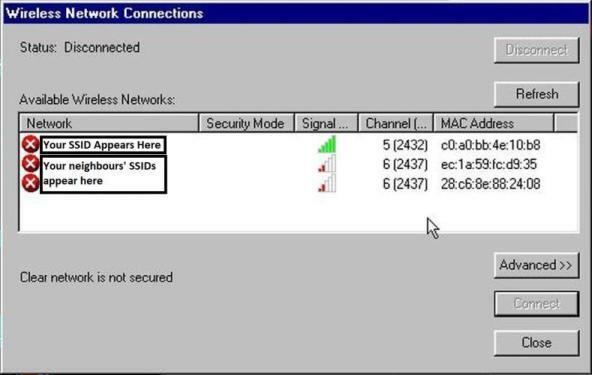 A foolproof way to verify this is to try the cards you are working with in a WinXP (SP2+) notebook, and see if the card can connect with WPA. 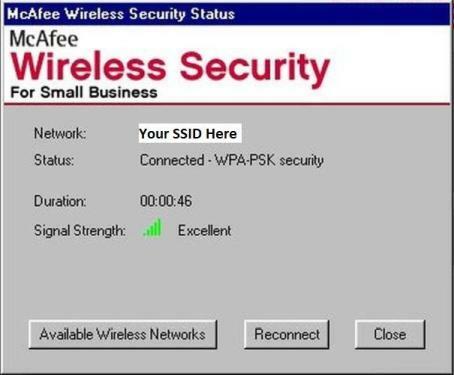 If it can, you have a card that has hardware/firmware capable of supporting WPA. Even modern client software cannot overcome the fact that a card does not support the encryption in its firmware. 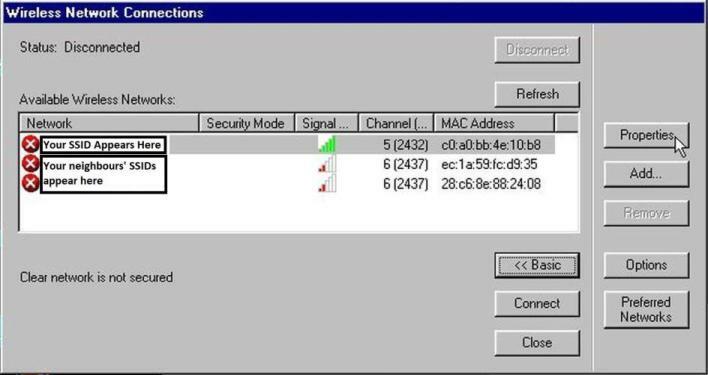 Typically, a failure will present itself either as network key mismatch errors, or you will not be asked for a key at all and the network will appear connected, but with no actual connectivity. Of the cards I own, the ones I concluded fit the bill are Cisco Aironet 350, and Avaya World Cards (which are Orinoco Silver cards). The network this card will connect to must support wireless-B. Since your main modern network probably isn’t a B network, you’ll need to set your router to a mixed mode, for example B/G/N. If your network only broadcasts in wireless-N, the B card will not be able to connect to it. Also, your network will need to be configured to use WPA and WPA2, because these B NICs even with WPA support will not handle WPA2. AES encryption is not going to work, so TKIP is a must. Drivers for your NIC. If you have the option, leave out the client connection program. Insert the NIC to ensure the drivers are present and working. Reboot if prompted. Ensure that, in the Network applet in Control Panel, there is a TCP/IP Protocol listed paired with the NIC you installed. If there isn’t, you’ll need to add it. A note for the Aironet 350: I’ve found the machine will hang rebooting for driver install with the card inserted. I just power cycle after it hangs for a minute or so. McAfee Wireless Security 4.1. When asked, Disable Authentication (this functionality is not needed for what we’re doing). During installation, if prompted, always keep the newer versions of files that already exist on your system (you may have just installed them in the steps above). That should do it for required software. We will now proceed using the McAfee software as the client software which manages your connection. The following screenshots are from my Toshiba Libretto 60, using the Aironet 350 as described above. After installing the McAfee product, it will add these two system tray icons. Right-click the key icon and click ‘View Available Wireless Networks’. 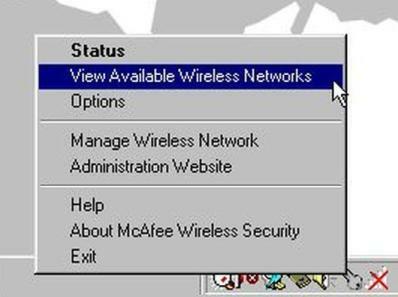 The McAfee software will display the wireless networks within range of your NIC. Highlight your network. Click the ‘Advanced’ button, then click the ‘Properties’ button. Specify ‘TKIP’ encryption. Recall that older wireless-B NICs do not support AES. You may try it, but if you have issues, switch back to TKIP. After specifying the encryption type, you will now be presented with a box to type your WPA-PSK (network key) in. Enter it in the box, and click ‘Connect’. Once the connection is established, the tray icons will change as shown. Viewing the status in the McAfee software should indicate that you are connected successfully.